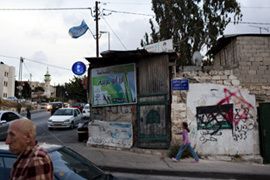 Guarnieri: “Israel’s ‘Street Apartheid’” | The Only Democracy? The excellent journalist Mya Guarnieri has a piece for Al Jazeera in which she focuses on the everyday inequality of street conditions in East Jerusalem. The difference can be as simple as a street light. In our road-driven culture, street lights are as good a symbol of any of mobility and restriction. What’s more they are an example of unseen authority, and seem to go off indiscriminately, a. But they do discriminate. Well done, Al Jazeera for picking up on that. In Palestinian areas of Jerusalem. Roads are poorly maintained. They are narrow and bumpy, riddled with cracks and potholes. Street signs and sidewalks are almost non-existent. Trash containers are usually communal and there are often too few to meet the needs of the neighborhood. Pedestrians, forced to walk on the shoulder of the road, wade through garbage. Jewish neighborhoods and settlements, on the other hand, are neat and orderly. Sidewalks and traffic circles keep pedestrians safe; roads are well-marked, some with lit signs. Most buildings have a garbage bin and the streets are free of litter. The part of the article about roads reminded me of stories old Hyde Parkers used to tell me of when the Chicago Machine used to refuse to pick up the garbage in their neighborhood (now famous as President Obama’s) as punishment for their supporting independent candidates. Thankfully, Chicago finally got a reformist mayor who ended that practice, though of course you still have class discrimination in neighborhoods in terms of their appearance. And at least many Chicagoans are citizens. Jerusalemite Palestinians are only “Residents,” which the article explains they have to be particularly vigilant about paying taxes for a government that discriminates against them. ‘If you won’t pay your taxes, you won’t have proof that east Jerusalem is the center of your life and if you can’t prove that, you will lose your residency,” Association for Civil Rights in Israel’s Nisreen Alyan explains. This means that one becomes stateless, a refugee. ‘Before [Palestinian residents of Jerusalem] find money to feed their children, they pay their taxes,’ Alyan says. And what is the breakdown of services they receive for those taxes? Daniel Dukarevich, in my recent interview, cited the different living conditions of Palestinians in East Jerusalem as something that made him become an activist. My worry, though, is that many Israelis don’t know about Palestinian living conditions or blame it on the Palestinians themselves, when it is clearly a matter of government policy. The article concludes with an anonymous Israeli Jew giving their read on the unspoken reason for such grave discrepancies.